FNQ FC Heat's first home game of 2014 ended on a low when Brisbane Roar NYL handed the Cairns-based side an 8-1 footballing lesson at Barlow Park on Saturday night. The Roar's superior speed and tactical nous saw them create a bevy of goal scoring opportunities and their ruthlessness in the final third ensured most chances were taken in the eight goal rout. Forwards, Kofi Danning and Jai Ingham proved particularly dangerous, both bagging braces in the team's first outing in the NPL. 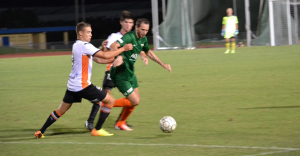 Roar's high-pressing, fast-tempo philosophy was evident from the very start as striker Brandon Borrello regularly harassed Heat's back-line, at times robbing them of possession in their own half and earning his reward in just the sixth minute. Jai Ingham capitalised on Heat defender, Jake Keslake falling over, playing through a well-weighted ball to Borrello who shot low and hard past goalkeeper, Kevin Ward. Heat restored parity 17 minutes later through captain, and former A-League player, Alex Smith, who hit a bullet-like drive from the edge of the box into the bottom right corner. But the Roar response was almost instantaneous, as winger, Kofi Danning made it 2-1. Ingham, a star of last year's NPL with Olympic FC, opened his 2014 goal scoring account, after a jinking run and strong shot. Just a minute after the half-time break, the Roar were once again celebrating as Danning's free kick curled and dupped into the top right corner, leaving Ward swinging at thin air. Ingham would out do his teammate with a similarly impressive dead-ball strike five minutes later giving the Roar a 5-1 lead. The Heat frustrations boiled over with centre-back, Cameron Morrison receiving a second yellow card and his marching orders for a late tackle. Roar utilised their extra man advantage as Ben Liftin and Mitch Hore added their names to the scoresheet in the final stages of the one-sided contest.